Our top of the line cover has a commercial grade 14 x 14 scrim count and has the heaviest coating in the industry. The cover is bound on the edges with commercial grade material and thread. 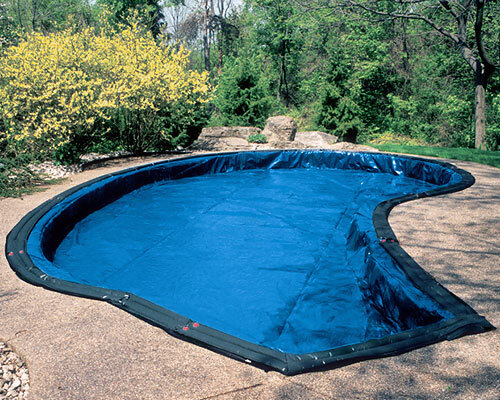 Incredibly strong Armor Kote winter cover provides your pool with extra tough winter protection for years to come. Armor Kote covers are 30% lighter and 50% stronger than other covers with a higher tear and puncture resistance and superior seam strength. 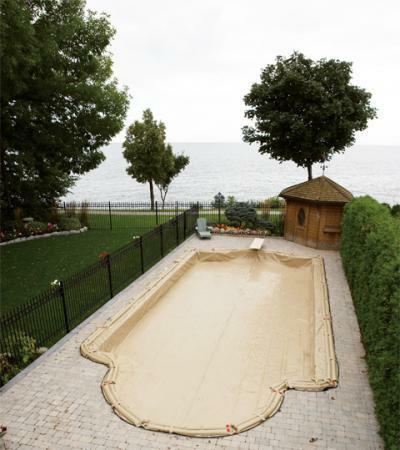 To retain its beautiful appearance season after season, this tan cover is specially coated with a chemical resistant polymer to resist staining from chlorine. Plus the deep blue underside prohibits algae growth by not letting the light in that algae feeds on! This cover will stay grounded with its heavy-duty water bag loops every 40 in. and corner loops for extra tie-down protection (matching tan water bags sold separately). 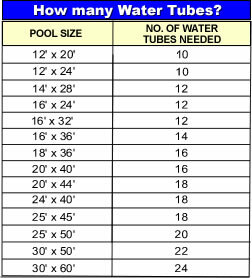 A 5 ft overlap on in-ground pools, 20 year warranty/ 5 yr full. 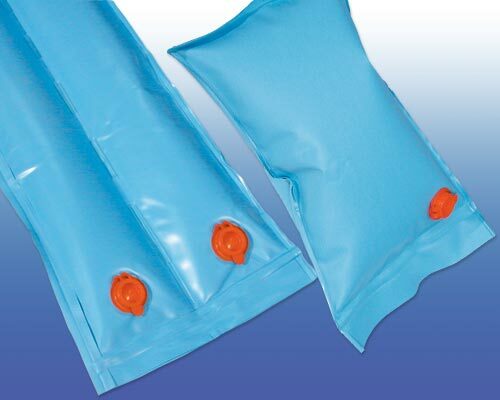 Water bags sold seperatly. Yard Guard Poly Woven covers are made from the widest material in the industry resulting in less seams for a bigger and stronger cover. All of our Poly covers are made from material under the most demanding guidelines of quality control, so you can be assured that your Yard Guard Cover is made to last. Enviro Cover is a patented reflective silver coated mesh pool cover that speeds up the melting process allowing water to filter through relieving the pressure on pool walls and the need for water where water is allocated or costly. Single chamber, double chamber, & wall bags. Yard Guard makes a variety of water bags to ensure that your in-ground or above-ground winter cover is secure and does it’s job all winter long. 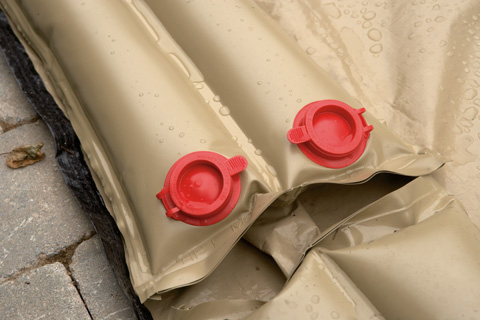 These traditional water bags are time tested and proven to protect your winter cover from collapsing under the weight of ice and snow. The single valve bag that performs as a double. This patented unique design to Yard Guard, has intermittent center seals that allows water to flow evenly into both chambers. Green / Black Cover 10 Year Limited Warranty (1 Yr. Full) Unbound with Triple Laminated Polyethylene. Yard Guard Poly Woven covers are made from the widest material in the industry resulting in less seams for a bigger and stronger cover. Finished cover within inches of actual pool size. Water bag loops and tie down loops on ingrounds. 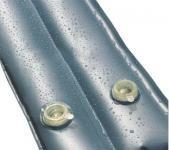 Reinforced nylon loops approximately every 30″ on above-grounds. Coated cable and metal winch on above-grounds. Covers come with 6, 8, or 12 year warranties. All covers made in Canada/U.S.A. Full size range of standards, rounds, ovals, and rectangles. Above-grounds available in 3′ and 4′ overlaps. In-grounds available in 5′ and 6′ overlaps. Specials available in either rectangle form or custom shaped to fit any shape and size. Silver/Black 15 Year Limited Warranty (3 Yr. Full) Unbound with Triple Laminated Polyethylene. Tan / Black 20 Year Limited Warranty (3 Yr. Full) Fully Bound with Durable Double Stitched Hems. 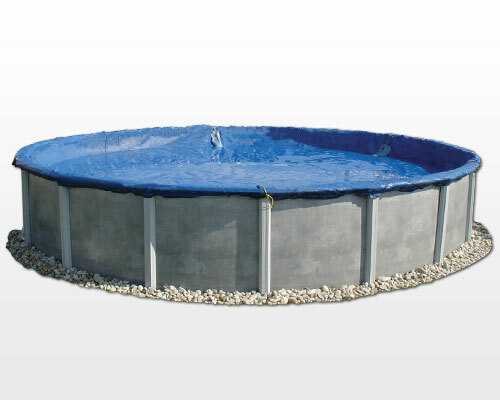 Incredibly strong Armor Kote winter cover provides your pool with extra tough winter protection for years to come. Armor Kote covers are 30% lighter and 50% stronger than other covers with a higher tear and puncture resistance and superior seam strength. Free Shipping! Tax Free 49 States!